Tim will be doing a Groundhog Day Musical themed Facebook Live Q&A on Tuesday at 12:30 EDT! This Tuesday, 30th May at 12:30 EDT, Tim’ll be doing a Groundhog Day The Musical themed Facebook Live Q&A! 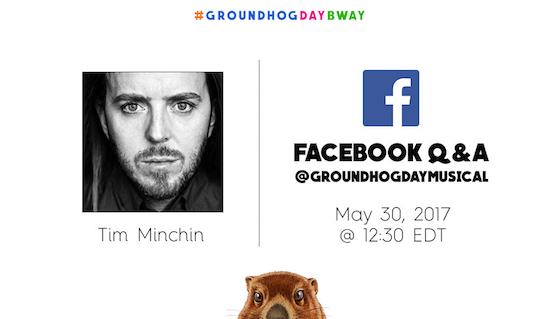 Tune in to Groundhog Day Musical’s Broadway Facebook Page to watch with your questions ready to put to him. Whether you’ve seen the show or not – ask him anything Groundhoggy! There will be music and dancing and answers… There may be music, dancing is sadly unlikely (unless someone asks very nicely) but there will be lots of lovely answers. There are various Time Zone Converters available if you’d like to check when to watch live in your part of the world. If you miss it live, fear not, you’ll be able to catch-up here later. Enjoyed Groundhog Day? Voting is now open for the Theater Fans’ Choice Awards! Voting is now open for this year’s Theater Fans’ Choice Awards (previously called the Broadway World Awards). These awards give theatre-loving fans the chance to vote for their favourite performances, performers and productions. Now in their 15th year, the Theater Fans’ Choice Awards are the largest fan based awards of their kind. Voting is open until June 6th, so please vote and spread the word to others who’ve enjoyed the show. Further information about the show can be found on the Groundhog Day The Musical Page, including videos, tickets, the Original Cast Recording and you can DOWNLOAD the Lyric Book. ICYMI – Video: Tim performing ‘Hope’ (Groundhog Day) at the 2017 Olivier Awards! Last month, Tim performed ‘Hope’, a song from Groundhog Day The Musical, at the 2017 Olivier Awards. Groundhog Day won Best New Musical and Andy Karl won the Olivier for Best Actor in a Musical for his performance as Phil Connors. The ceremony was held at the Royal Albert Hall and screened by ITV. (The backing was for the song not the facial hair). Did you spot the cute lil groundhog on every page yet? In the tabs ^ up there ^. There’s further information about Groundhog Day The Musical on the shiny new Groundhog Day Page, including more videos, how to get tickets and where to find the Original Cast Recording. Plus, you can now DOWNLOAD the Lyric Book directly from the page. 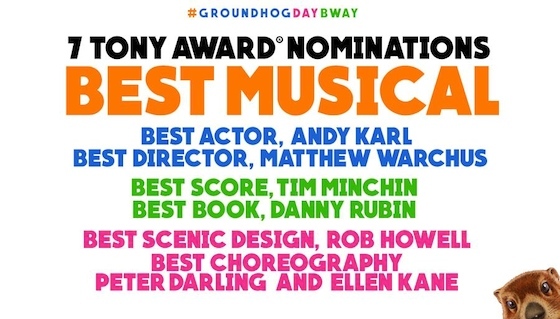 SEVEN Tony Award Nominations for Groundhog Day Broadway, including Best Musical and Best Original Score! Today, Groundhog Day The Musical on Broadway received a fabulous SEVEN nominations for this year’s Tony Awards! The 71st Annual Tony Awards will be on Sunday 11th June, 2017, with Kevin Spacey as host. The ceremony will air on the CBS Television Network at 8:00-11:00 PM, ET/delayed PT, live from Radio City Music Hall in New York City. Many congratulations to Tim and everyone at Groundhog Day Broadway!